My amazing Sister In Law is a hard working mom of two busy boys/men-now. She teaches at a school where she reaches these kids in a special way. My kids just love her, she is quick to play or read to them, gets on their level and connects... We are blessed that she is my husbands older sister! 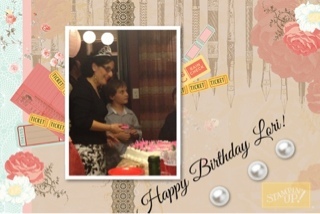 Lori is celebrating her 50th birthday but looks much younger. We have discussed the enjoyment of wearing colors. 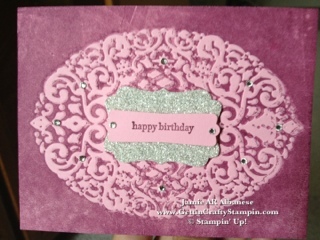 I couldn't resist giving her a rich card with yummy color and sparkle. I purchased a purple n white jeweled bracelet as part of her gift and decided to do a similar colored card to bless her. With Pretty In Pink cardstock for the base I used a Brayer and loaded up Rich Razzelberry ink. I then inked with the Brayer on the Holiday Frame embossing folder the ink. This goes on the smooth side only. I placed and careful not moving it, embossed it through the Big Shot. This causes the ink to go around the pattern/design and the area that isn't inked embosses with the texture and shows in the original color like it does with this Pretty In Pink texture. The Basic Jewels, adhesive backed rhinestones to a few spots around the pattern of texture. This is similar to the bracelet that was jeweled purple stones and a dash of white jewels of more bling. I used the Decorative Label Punch to punch out the label punch in the Glimmer Paper. The Tiny Tiny Wishes Happy Birthday Greeting fits perfectly in the Modern Label punch. I added a dash more bling w/the Basic Jewels that frames the Rich Razzelberry stamped sentiment Ob the Pretty In Pink paper. 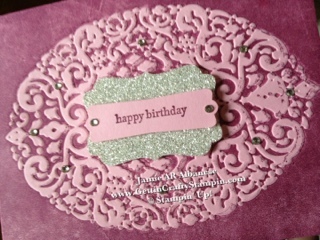 Stampin' Dimensional Adhesive allowed each to layer and float. This also added dimension too! How would YOU celebrate that special lady in your life? The one who is full of color and style? ?